Chief Minister Shri Shivraj Singh Chouhan’s ambitious water conservation campaign ‘Namami Devi Narmade’-Seva Yatra-2016 completed 75 days on February 24, 2017. With significant public participation by the country’s 428 sadhus, politicians, social workers, best of artists, prestigious subject experts etc. the Yatra has become a wonder in the world. The Narmada Yatra has covered a total of 1840 kms in 75 days. 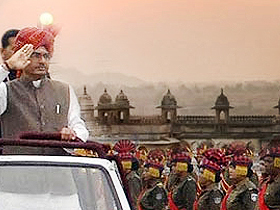 The Yatra is currently passing through the 13th district –Dhar. 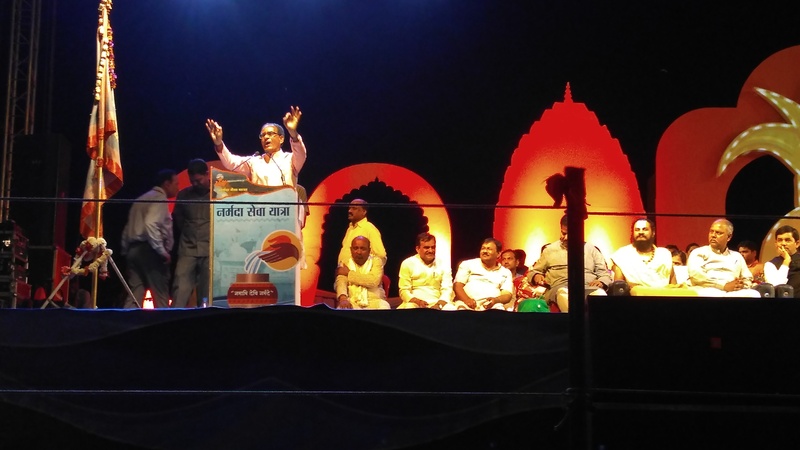 In the Yatra of Narmada’s north bank, 376 gram panchayats, 442 villages and 36 development blocks have been included. During the Yatra 437 Jan-Samvad progammes were organized in the presence of nearly 12 lakh 67 thousand participants in which upyatras were also taken out from nearby areas. So far 903 upyatras have merged into the main Yatra. At least 17 thousand Narmada Sevaks have so far registered themselves on the Narmada Seva website. A symbolic 28 thousand 672 saplings have so far been planted during the yatra. The Forest Department has started a massive tree plantation programme in one lakh 44 thousand 377 hectare area through one lakh 18 thousand 85 agricultural families from 882 villags of 292 gram panchayats of 16 districts of 8 circles from both banks of Narmada. Nearly 12 lakh 42 thousand persons have been administered the oath of drug de addiction and Narmada conservation. About 1950 voluntary organizations are extending support to make arrangements for food etc, for the members of the Yatra team. The Chief Minister has constituted four cells headed by senior administrative officials for Narmada conservation. 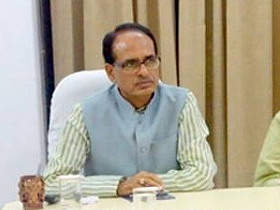 During the yatra, Chief Minister Shri Shivraj Singh Chouhan joined the Yatra at 21 places which includes Ramghat-Amarkantak, Bondar and Karanjiya, Gadasarai, Dindori, Chabi, Ramnagar (Mandla), Ghansaur (Seoni), Barginagar (Jabalpur), Brahmapur Kund (Gotegaon), Sandiya Sangakhedakhurd, Sethani Ghat (Hoshangabad), Handia, Karanpura (Harda), Singaji, Poorni/Hanuvantiya, Omkareshwar (Khandwa), Navdatondi (Khargone), Mohipura (Badwani), Bhagoria Maidan Chhaktala (Alirajpur), Koteshwar (Dhar) and took part in Jan-Samvad progammes. In the coming days, eminent personalities who are expected to take part in the yatra are Tibetan religious leader Shri Dalai Lama, Central Water Resources Minister Sushri Uma Bharti, Maulana Lukman Tarapuri, Swami Shivanand Saraswati, Shri Bhaiyyuji Maharaj, Shri Popatrao Pawar, Swamiji Kapri, Jagatguru Shankaracharya Swaroopanand Maharaj, Well known author Shri Amritlal Begad, Shri Divyanand Teerth, Shri Satyamitranand, Shri Gyanswaroop Sanand, Swami Samvit Somgiri, well known danseuse Sushri Sonal Mansingh, Shri Pundarik Maharaj, Shri Sudhanshu Maharaj, Shri Pranav Pandya, Srisri Ravishankar Maharaj, Swami Shri Muktanand, Swami Vidyanand Saraswati, Shri Anna Hazare, Shri Rohini Chaturvedi, actor Shri Manoj Bajpai and Shri Anupam Kher, Pandit Kamal Kishore Nagar, Dr. M.D. Thomas, Shri Subhash Bhargav, Shri Pasha Patel, Shri Bharat Bhushan Garg, Shri Ashok Soni, well known environment expert Sushri Sunita Narayan, famous singer Sushri Penaz Masani, famous classical singe Pandit Jasraj, actor Shri Raghuvir Yadav, ghazal singer Shri Talat Aziz, Mohan Veena Vadak Pandit Vishwamohan Bhatt, Shri Arun Jain, actor and stage artist Shri Tom Alter, 25-member research team of Teri University, 25 members of Rashtriya Yuva Yojana and several union ministers.